It's British Pie Week and I've been enjoying one of my favourite pies, a Spinach, Feta and Roast Pepper Quiche from Higgidy with a rather higgidy Turkish carrot and beetroot side salad. This salad is one I have fond memories of from our many trips to North Cyprus where my husband's parents live. The north of Cyprus is Turkish and this salad is one we always enjoy in a little cafe called Ibrahims (Halil Ibrahim Sofrasi) in Girne. The cafe is hidden down a side street and specialises in kebabs. They make the most amazing flatbreads in their on site bakery which is right beside the cafe (if you want to stop and watch or to have a chat. They are a friendly bunch). This outdoor cafe is nothing much to look at, in fact you might turn your nose up at the basic furniture sitting next to a dusty car park, but all the locals eat there and the food is simple, but tasty and very cheap. We often have a cheese dürüm, which is a flatbread kebab wrap filled with shredded salad, hellim (Turkish halloumi) and chips (yes they add chips to their wraps). 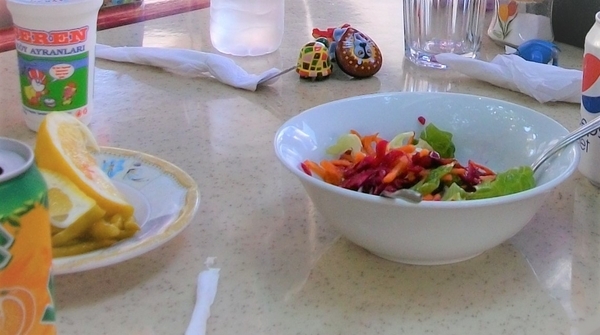 The meals are always served with a simple side salad of salad leaves, carrots, beetroot, cabbage. 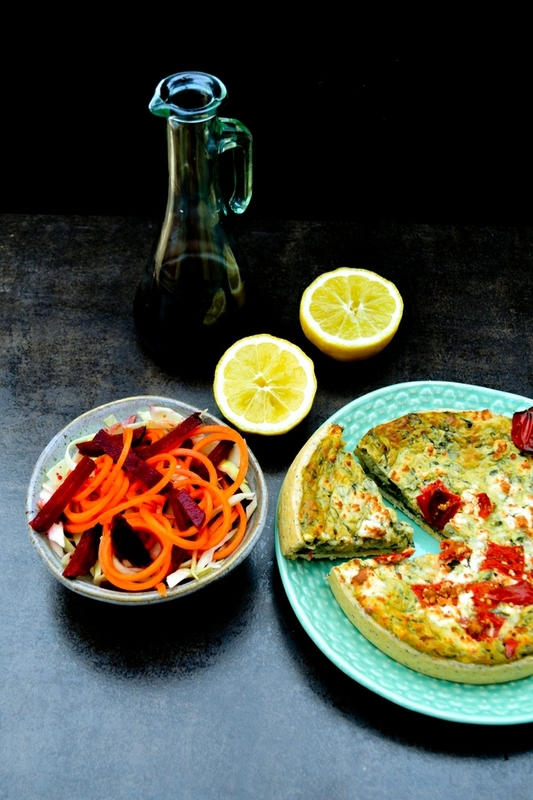 The salad is elevated with a pomegranate and lemon dressing and served with wedges of lemon to squeeze over the salad. It's delicious and as you can see the original is rather higgidy too. Not anywhere near fine dining. I served my side salad with a slice of Higgidy quiche which came in the most beautiful box. The quiche I bought was in a orange box with a beautiful peacock design. Just lift the flap to see the quiche within. Oh and just so you know, I serve my quiche cold. I think there is nothing as vile as hot quiche. Don't even try to persuade me any differently. Higgidy don't just sell this Spinach, Feta and Roast Pepper Quiche, they actually have a good collection of veggie pies, quiches and sausage rolls to try and they are much better than any of the other supermarket brands I've tried. They are always packed with filling and they are never stingy with their ingredients. Unfortunately I can only buy them in Saisnburys which is the other side of the city from me and a bit far to shop in often, so they remain a treat on the odd occasion I do shop there. I spiralized my carrots with a little hand spiralizer from OXO good grips (I lost the handle of my bigger spiralizer, heaven knows where it is), but you can just shred your veg with a knife or the large cut on a box grater. This isn't meant to be a bonnie salad, it's more like a vegetable coleslaw with a fruity dressing rather than a creamy one. A simple Turkish salad of shredded white cabbage, carrots and beetroot sitting on a bed of salad leaves, dressed with a fruity pomegranate and lemon dressing. Utterly delicious! Don't be fooled by how simple this recipe is. It's a great one to have in your repertoire. 1. Place the salad leaves in 4 side bowls. 2. 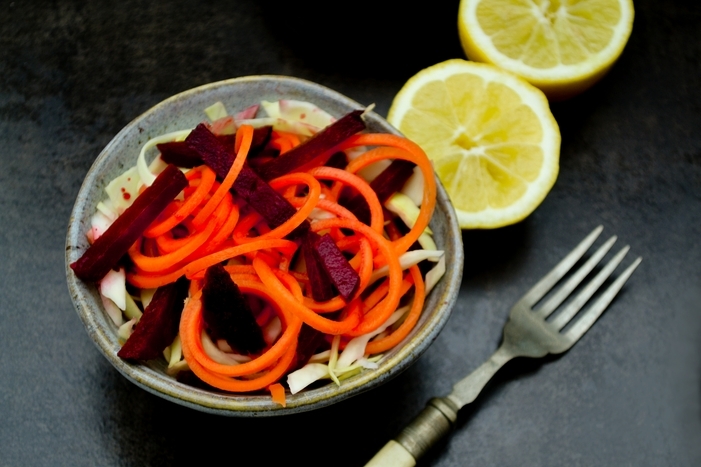 Shred or spiralize the cabbage, beetroot and carrots and mix together. 3. Whisk together the dressing ingredients in a jug with a fork or shake in a jam jar. 4. Top the salad leaves with the mix vegetables and drizzle over the salad dressing. 5. Serve with a slice of quiche or pie. Higgidy are celebrating British Pie Week with the hashtag #mykindofperfect. Follow the hashtag on Twitter and Instagram to join in the conversation. Disclosure: This recipe was developed for Higgidy. I was not required to write a positive review and any opinions expressed are my own. I love spiralizing beets! They are the best! My beets were a bit too soft to spiralize with my wee hand spiralizer. So I just chopped them. Maybe next time. Oh that is disappointing. Higgidy Pies are good, but you are right Australia is a bit far to come for pie. Love the colours of this salad, these simple salads are so good and I bet it's got a good crunch to it. I have never tried pomegranate and lemon dressing, sounds interesting, will give it a try. Thank and the dressing is so good. Oooh, this looks delicious! And the pomegranate salad dressing sounds tasty. I love making recipes inspired by travels and family. Thanks Mary Ellen, the dressing is good and yes you must visit Cyprus. I've never seen spiralised beetroot before, what a great idea! This salad looks like a lovely accompaniment to the pies. Well, my beets weren't firm enough so I ended up chopping them, but if they were a little firmer you could. That dressing sounds perfection. I am obsessed with pomegranate molasses at the moment. I do like bringing recipes home with me from holidays and trips. I love the Higgidy products, they really are good enough to pass off as your own work! It's a great ingredient isn't it? And yes Higgidy pies are good. Just had a slice of their quiche for breakfast. Well it is egg based. Your salad looks perfect. I'm a big fan of little cafes that don't look up to much, but if you're in the know the food is fantastic. 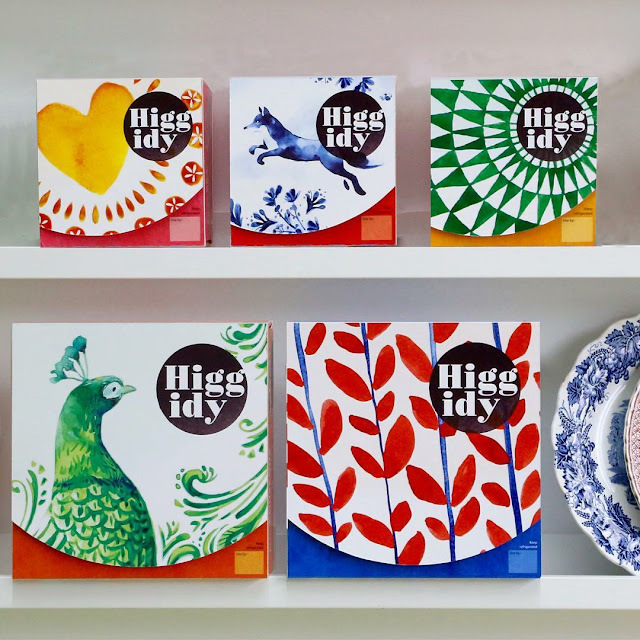 Love the look of the new Higgidy packaging. Just wish I had one of their pies to hand now. Pinned, stumbled, flipped and yummed. Yes it's definitely worth looking for where the locals go when on holiday. Better prices and food. The Higgidy packaging is rather gorgeous. This salad sounds so refreshing, and I love the colors. I bet the food in Cyprus is amazing! I will definitely be trying this salad. Beets and carrots are perfect together. It's pretty good, but quite hard to get local veggie food as they too cater for tourists, yet in their homes they make fabulous veggie dishes.